The thrill of going on a game drive is difficult to top, so our advice is try and soak up the views from all the sharing spaces and sit back and take in the view, keep your binoculars handy as you never know what you’ll spot! Relax in our Main Tent that features an open but snuggly lounge area with fireplace, a library of books, iPads, iPod docking stations and speaker systems and a TV/DVD. We’ve got a 12 metre outdoor infinity pool, big enough for a leisurely swim or a refreshing dip. Game drives filled to the brim with exciting African wildlife sightings. 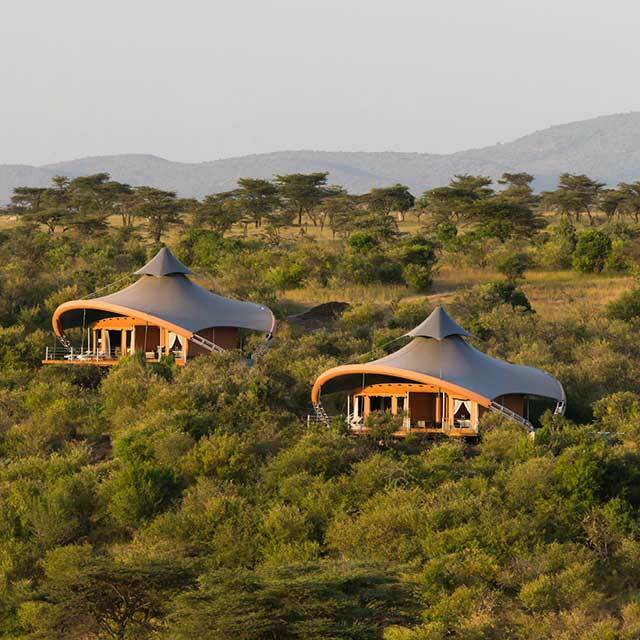 At Mahali Mzuri we have twice daily game drives which are filled to the brim with exciting wildlife sightings as well as romantic scenery and dramatic views. To find out more information about game drives, head to our Game Drives section. Game drives in the evening open up a whole new world with the chance to see predominantly nocturnal game including aardvarks and honey badgers. 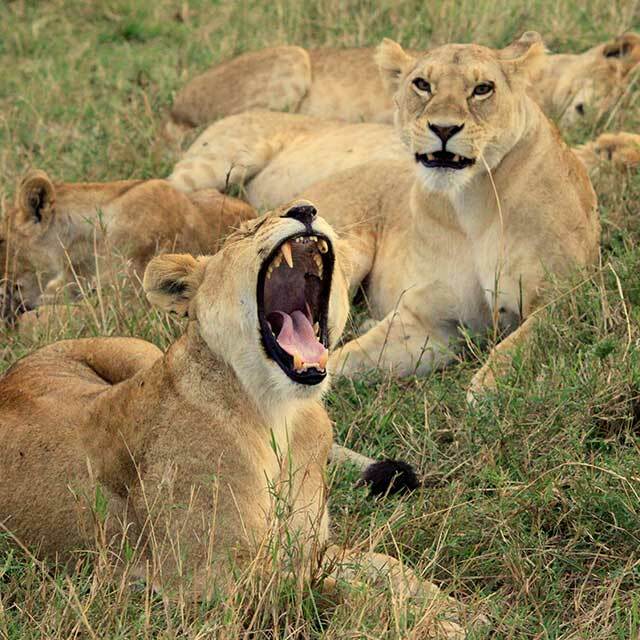 Full day excursions with a packed lunch give us the flexibility to really explore the conservancies, and for the curious we can also organise day trips to the Maasai Mara National Reserve. Private Vehicles are available and can be pre-booked subject to availability, they are charged at $600 per vehicle per day. Guide accommodation is available at $150 per night, subject to availability. While you’re staying at Mahali Mzuri you’re welcome to visit one of the Maasai villages in the local area to get a flavour for daily life in the Mara and to learn about the local Maasai Tribe whose traditional pastoralist customs are still very much in practice. 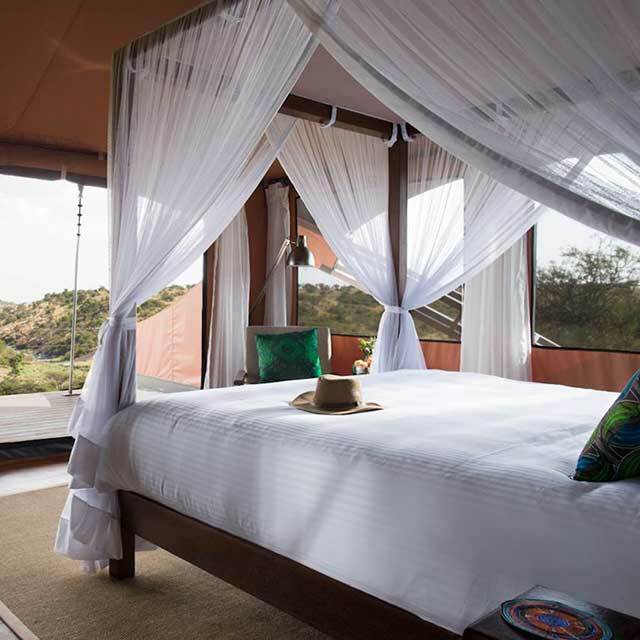 The village is only 10 minutes’ drive from Mahali Mzuri and the best times to go are first thing in the morning when you can help milk the cattle or in the evening when the cattle, goats and sheep are being herded back to their enclosures for the night. The local school is a further 5 minute drive from the village. This is where the Maasai children aged 3-15 years attend. You are welcome to visit the school, please let your guide know in advanced of your trip.Your Guides at Mahali Mzuri will take you on a tour and introduce you to their families while explaining some of the cultures and traditions. What better way to relax than at Nasaro - which literally means 'refuge' or 'relaxation' in Maa - the local language. Nasaro is located down near the valley floor and provides a private, intimate setting in which to be pampered. We use a range of products from Africology ethical skin care products to capture the rejuvenating and healing essences of Africa. A whole range of treatments are available, from facials to massages to those essential grooming rituals. Below are just a sample of what we have to offer. Spa treatments are available for an additional charge. Indulge in our signature deep tissue massage. A bespoke treatment tailored to work into your tense muscles. This signature treatment releases tension held in every part of the body, leaving you feeling deeply relaxed and recharged. Stresses and strains are dissolved away. This experience starts with a full body exfoliation to prepare the skin for one of our all active body masks. 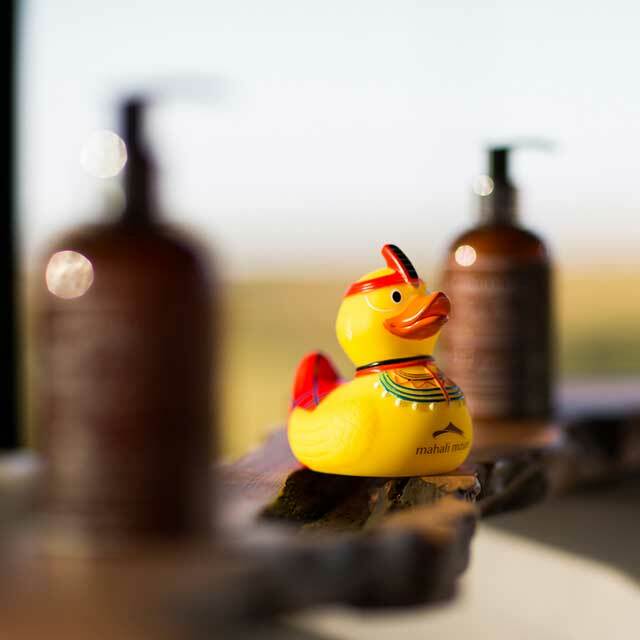 To complete this body cleanse we nourish the skin with one of our herbal body oils, while the mind drifts to the background sounds of Africa. This couples treatment includes a full body massage, incorporating the use of rose quartz crystal. It is best performed by the side of your partner to reconnect you as a couple. The 90 minute option includes an additional pressure point foot massage. Choose one of our easy melting Shea balms from Ghana, that are blended with African potato, Rooibos and a selection of Neroli, Chamomile, Jasmine or Black Pepper essential oils. When massaged into the body the balms deeply hydrate the skin while the Aromatherapy and scalp massage soothes the mind. Your therapist will help you select one of our Africology massage oils: Relaxing, detox, energising or muscle relaxing. The oil is then applied and massaged deeply into the body focusing on mobilisation of joints, easing areas of tension and relaxation of mind. A gentle and warm rose quartz and Amethyst crystal massage that releases pent up energy likely to cause muscular stress. A beautiful way of balancing the body’s energy centre, to create optimum health and well-being. This is an ideal treatment for those looking to relieve stress. Skilful movements are performed with the hands and different sized wooden sticks are used to stretch tight muscles and ease toxic overload from daily stress. Perfect to combat the effects of travel, relieving stress and tension in the scalp, stimulating circulation and invigorating the legs with coffee and mint. This balancing treatment creates hypnotic state of mind to encourage rest and relaxation. Reflexology, or zone therapy, is the practice of controlled pressure on 'reflex zones' found in the feet with the goal of encouraging a beneficial effect on other parts of the body and for relieving symptoms of tension and stress. Our bespoke treatments are the ultimate luxury. After a full consultation with your Therapist a tailor- made experience is customised, using a combination of body therapy or skincare to indulge in your every need. Simply choose your length of treatment time and allow us to intuitively work with your body and relax your state of mind. This wonderfully deep cleansing and regenerating facial looks at the skin holistically, working to maintain balance and a healthy radiance. Your treatment will include a thorough skin consultation using therapeutic serums that treat the appropriate skin conditions. Introduce your skin to the Africology range, we will tailor the treatment to your skins needs. Begin with the mentally relaxing notes of the Tibetan chime, followed by a warm scrub and balm infused back massage to create a relaxed state of mind. Paired with our de-stressing cell renewal facial, rich in natural oils, that deeply hydrates and connects you to the goddess within. This relaxing remedy is about treating the skin and nails naturally to keep them hydrated and therefore flexible and strong. An intensely hydrating African potato wrap, blended with natural antioxidants, is applied to ensure continued skin health and to rejuvenate the hands and feet. While the wrap sinks into the skin, the shoulders are also massaged. NB: If you require French polish please advise at booking as this will take an additional 15 minutes and is subject to a $10 USD charge.